Your domain name is the core component of your online presence—the address of a piece of online real estate that belongs only to you or your business. Choosing the right domain name and registering it are essential first steps for securing your company’s online home, but they’re not the only ones. To stay updated and secure, a domain needs ongoing management, whether it’s a single domain owned by a new entrepreneur or part of a large portfolio of domains owned by a large corporation. Every domain name owner needs to practice some form of domain management—and a wide range of domain management services and tools can help users with tasks ranging from keeping domains updated and secure to tracking performance with sophisticated analytics. Domain management, or domain name management, refers to the ongoing tasks of keeping a personal or corporate domain (or domains) stable, secure, and able to support related websites. The domain name not only establishes its owner’s presence on the Internet, it also serves as a portal to a business or personal website designed to serve that owner’s unique needs. Site owners may be tempted to focus all their attention on setting up and maintaining the website itself, but managing the domain is a key factor in keeping the website live and accessible. Securing a domain requires only a few steps. Finding the right domain name can take some time and thought, plus the help of online tools to search available names, but once a name has been picked, all that’s needed is to register it either with an independent registrar or a web hosting company for a term of one or multiple years. Once registered, the name is assigned to a host’s primary and secondary nameservers, which point the domain to a website. Individual users and small businesses might find that a single domain name is all that’s needed to establish an online presence and develop a brand. Larger corporations and those with a number of different business interests may need multiple domains. Many registrars recommend buying as many related domain names as possible to keep them from being used by competitors and to capture all possible variants that might be typed in during a search—including misspellings. That can result in a large portfolio of domain names, some of which may never be used. Whether a user buys one domain or many, though, ongoing management keeps them updated and working to support the websites they serve. How does domain management work? Domain management can take various forms, depending on a domain owner’s individual goals and needs. But, in general, a domain owner needs to be able to perform essential tasks such as renewing or terminating domain name registration, determining nameservers and hosting providers, and making changes to domain names if needed. Because a domain establishes its owner’s online identity, managing that domain can also include checking for similar names that might be harmful to a brand’s reputation or authority, or tracking analytics to see how it performs in searches. Another key part of domain management involves security—validating IP addresses associated with the domain and checking for suspicious access to the domain. Essential domain management tools are available either through the registrar, or they can be integrated into the control panel provided by a web hosting service. These tools offer a graphical, non-technical way to manage settings related to maintaining all the domains on a user’s account. These DIY management tools allow users to handle key tasks such as renewing or terminating domain registrations, validating IP addresses, and configuring nameservers. A variety of paid and free domain management tools online can also handle essential tasks such as registering and renewing domains, managing multi-domain portfolios, and tracking domain performance. Some may also include domain name generators and other tools for managing multiple registrars and nameservers, and for keeping domains secure. Available through the cloud or downloadable to a user’s own desktop, these tools allow users to control all aspects of domain management on their own. Domain management can also be outsourced—this is an appealing option for users with multiple domains or corporations with a large domain portfolio. Because businesses of all sizes often buy multiple related domain names with different extensions, they can end up with a large portfolio of domains, some of which may lie dormant for long periods of time or never be used at all. Others may be associated with different nameservers or with hosting accounts that have varying terms of renewal. To manage a large and diverse collection of domains, corporate users may turn to domain management services, which offer a variety of service plans for tracking and maintaining all the active and inactive domains in the portfolio. Domain management services use their own suite of domain management tools to handle domain registrations and renewals, review the portfolio and delete unused and unneeded domains, and maintain domain security. With sophisticated analytics for tracking unauthorized uses, site performance, and other key metrics, these services can work with clients to address issues and make changes to existing domains or the portfolio as a whole. While domain management services are widely used by larger businesses, they can also be a useful solution for busy domain owners running small- or medium-sized – businesses, or even individuals who don’t want to manage domains themselves. A domain name secures a user’s “realm of authority” on the Internet and makes it possible for individuals and businesses to create an online presence. Whether you’re a solopreneur, a small business, or a large corporation, managing your domain—or your domain portfolio—is as important as managing your website. 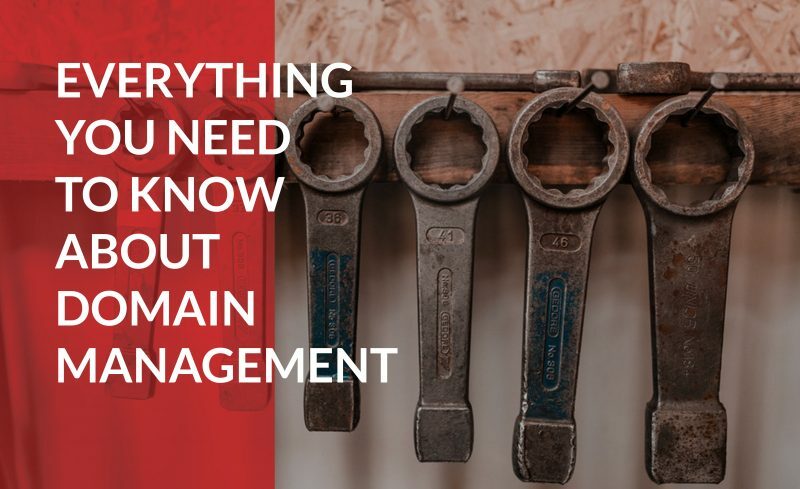 For users of all kinds, domain management tools and services can help keep domains secure and stable, long after they’re purchased and registered.